The first initiative to establish a learned society in Serbia came in 1833 from Dimitrije Tirol, the tutor of Prince Miloš’s sons. The “Serbian Learned Society” that Tirol advocated was not set up at that time because the Prince, as an absolute ruler, decided that the conditions were not ripe. Following the establishment of a gymnasium at Kragujevac (1835), the expansion of the network of primary schools and the establishment of several semi-gymnasiums, came the establishment of the Belgrade Lyceum (1838/39). After the abdication of Prince Miloš (1839), that is, during the reign of his second son, Prince Mihailo, in 1841 several Lyceum teachers launched an initiative to establish a learned society. The proposal “to set up a learned society following the example of other enlightened countries” was submitted by natural law teacher Jovan Sterija Popović and mathematics teacher Atanasije Nikolić. That the “project” was justified was confirmed by senior supervisor of schools Dimitrije Isailović. On November 7, 1841, Prince Mihailo issued an ordinance decreeing that the Prince himself, based on a proposal put forward by the Ministry of Education, was to appoint the first full members, who were then to elect all other members. Three categories of members were provided for in the ordinance: full, corresponding and honorary. Drawing to itself all the prominent men of science and letters of the time, the Society of Serbian Letters commenced its activities. The first of them were those related to terminology (aimed at enriching the Serbian language) and collecting archival material closely linked with the cultural history of the Serbs. 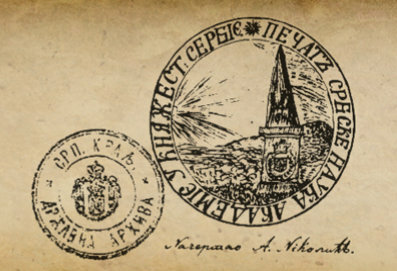 In 1847, Glasnik Društva srbske slovesnosti (Herald of the Society of Serbian Letters) started being published. A total of 17 volumes came out, with the bulk of each issue’s content dedicated to historical material, sources related to Serbian medieval history and the period of the First Serbian Uprising. The first several volumes dealt with language problems and focused on collecting material for establishing terminological foundations for a grammar of the standard Serbian language.